Milwaukee is experiencing a development explosion with Marquette engineering alumni leading the way. The Milwaukee Journal Sentinel says an “extraordinary building boom is reshaping Milwaukee’s skyline.” The Milwaukee Business Journal describes a “Downtown Milwaukee Renaissance.” And Milwaukee Mayor Tom Barrett crows that his favorite bird is the crane — referring not to the avian variety but the flock of towering steel machines roaming our skyline. Milwaukee’s metamorphosis is undeniable. So is the excitement and sense of pride these projects are bringing. With billions of dollars being invested, Milwaukeeans are being put to work, and the groundwork for the city’s evolution and growth is being laid before our eyes. Leading this unprecedented wave of construction are six young, highly talented Marquette University Opus College of Engineering graduates. These engineers are managing many of Milwaukee’s latest signature projects worth more than $1 billion combined. And they’re thrilled to be literally building Milwaukee’s future. Angie Helfert, Eng ’07, is leading one of Milwaukee’s most talked about projects — the new $524 million Milwaukee Bucks arena under construction downtown. Helfert, with Mortenson Construction, Brookfield, Wis., is the project manager for structure. Helfert says she’s amazed by the pace and quality of work. “Seeing measurable progress is one of my favorite parts of being in construction, and every day the project changes significantly,” she says. John Peronto, Eng ’03, Grad ’03, with Thornton Tomasetti, is working on the $122 million, 44-story Couture high-rise apartment on Milwaukee’s lakefront. Peronto, lead senior structural engineer and engineer of record on the project, is excited about how the striking Couture tower will change Milwaukee’s skyline. “It is very slender and tall, and its location will transform the urban landscape of the southeast part of downtown, further connecting it to the lake and the Third Ward,” Peronto says. Mary Collins, Eng ’06, is also helping build a new Milwaukee, but rather than bringing a signature new building out of the ground, Collins is focused on what lies beneath the ground. Collins, with Gilbane Building Co., is project manager for the current $13 million phase of the foundation restoration of Milwaukee’s City Hall — a historic 122-year-old icon. Collins is fascinated by restoring a historic building’s foundation and learning about its original designs. The project involves a nontraditional design where the original limestone bases of each steel-support column are encased, shifting the loads from the old wood pilings underneath to the new concrete bases, tied in to new steel pilings driven 35 feet underground; it’s a novel approach being used only for the second time in the United States. Not all cranes around town are dedicated to buildings. One of three senior project managers for the nearly completed $200 million Zoo Interchange’s Phase 1 project, Dr. Nicholas Hornyak, Eng ’03, Grad ’05, ’10, sees how important highway improvements can be. Now that the project is almost completed, Hornyak, with Edgerton Contractors Inc., Oak Creek, Wis., fully recognizes the overall impact it will have. Carolynn Gellings, P.E., Eng ’05, Grad ’17 , now with DAAR Engineering, went from serving as design and construction project manager of the $193 million I-794/Hoan Bridge reconstruction to design project manager of the Lakefront Gateway redesign to, today, construction manager for the $128.1 million Milwaukee streetcar project. 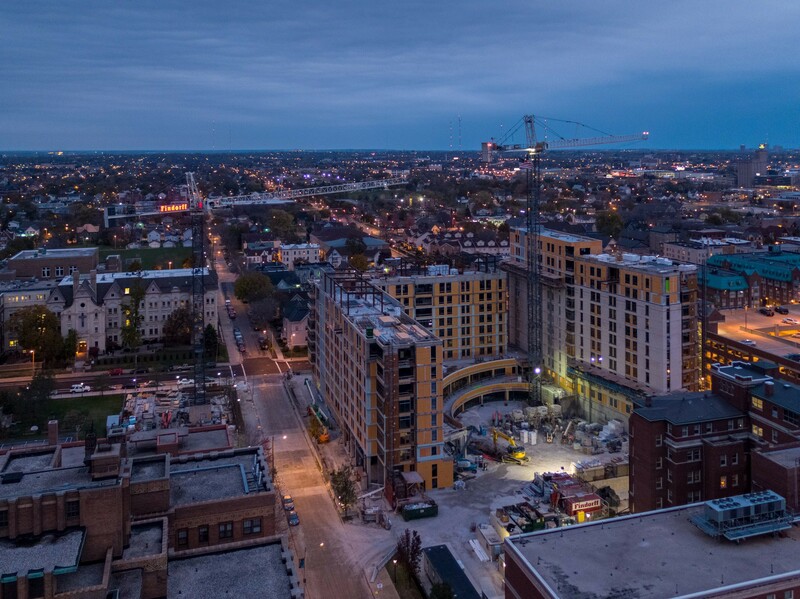 Mike Stern, Eng ’10, is a proud Marquette grad who feels a special connection to his current project — the university’s first new residence hall in 50 years, the Rev. Robert A. Wild, S.J., Commons, which will house 890 freshmen and sophomores when it opens in fall 2018. “Marquette has helped me end up where I am right now, and I think the best way I can give back is by helping this project be successful,” says Stern, who is with J.H. Findorff & Son and a project manager on the residence hall. Beyond learning construction fundamentals, Dr. Yong Bai, McShane Chair in Construction Engineering and Management and professor of civil, construction and environmental engineering, says students are taught to think critically, develop problem-solving skills and perform effectively in real-world assignments. “Besides technical know-how, our program provides students with essential non-technical skills needed to effectively work with and lead a diversified workforce in the construction companies that operate in both domestic and global markets,” Bai says. Dr. Mark Federle, P.E., associate dean for academic affairs, acknowledges that the successes of these six grads are representative of the impressive work being done by Opus College grads around the country — and the world. Peronto, the alum managing The Couture, is also working on Saudi Arabia’s Jeddah Tower, soon to be the tallest building in the world. But he says Marquette engineering alumni play a role in Milwaukee’s future that eclipses the size of their projects.